Hendrik Booraem V has performed an impressive and unique contribution to the study of our thirtieth president. Carving his niche in relating the lives and eras of Presidents when they were young men, Mr. Booraem focuses in this work on the first twenty-three years of Cal Coolidge’s life. Booraem takes us along with young Coolidge through his rural upbringing, study at Black River Academy and St. Johnsbury, his time at Amherst and finally his dilemma in choosing a career. He studiously avoids the familiar terrain of previous biographies, the man as President, and only connects who he was with who he would be at the close of this book. Even then, he never indulges in any kind of narrative by which Coolidge’s rise was inevitable or foreseen. In fact, Booraem presents the red-headed young man with that justified infusion of sympathy and respect that makes a fair-minded understanding possible. 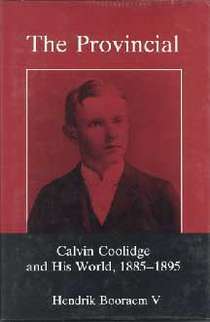 As such, Booraem gives proper place to the long correspondence between Calvin and his father as well as Coolidge’s much-underrated but actually revealing Autobiography. Booraem has presented his subject carefully despite the gaps in the record that consternate every Coolidge researcher. We are guided back to the quiet, secluded countryside of Plymouth Notch, to meet the rugged families of that area and discover that the place and time were colorful and exciting in their own independent way. We meet Cal’s father, mother and sister, his grandparents and the aunts and uncles he regarded so dearly. We learn that while the shy Vermonter inherited much from his forbears, he remained enigmatic even to neighbors. A keen consciousness of his frailty and proximity to death remained a force in how his life unfolded the way it did. It was assumed he would succumb early as his mother had. He outlived those early expectations and achieved incredible success when all indications of personality and energy seemed to circumvent that. As Booraem notes, Cal turned out to have “abilities in such abundance” that few can make sense of him at initial glance. Some biographers stop trying and are content to caricature him instead of attempting to understand him. Booraem avoids this pitfall and introduces us to a young American boy growing up in the 1890s whose reticence conceals much more than meets the eye. Booraem’s style is analytical but fluid. 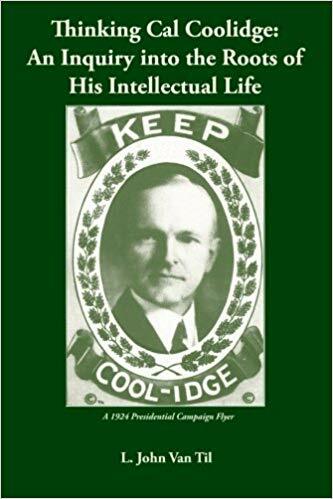 He succeeds in exploring that line that has eluded so many between “Coolidge the Vermonter” and “Coolidge the human being.” It makes for a fascinating read in psychology as much as biography and is difficult to put down. It is full of many of the same life struggles and questions, uncertainties and successes, of any young person today. I enthusiastically recommend it. Thanks to Booraem’s painstaking efforts, we see Calvin in a fuller light than others have recognized. We find Calvin’s interest in the whimsical and theatrical as a youngster, the development of his wit and intellectual “power,” as he would call it. We see his love for and skill in the art of debate and rhetoric. We see him as the quiet observer rather than the energetic doer. 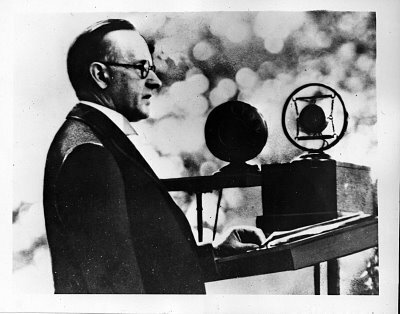 Yet, by the end of the book, the stage is set for what Coolidge would become. It was not that college had changed him, he remained the same through his time there. Those four years would simply reveal and refine what was already present within him. Booraem shows that he developed quietly on his own, not in seclusion, but as the solitary young man in the crowd who watches, learns and improves through diligent work. He was no athlete but possessed a much more enduring kind of strength. He had friends, to be sure, Hardy and Deering foremost of all, but he was his own person. He knew who he was and what he learned from Morse, Garman and the rest, confirmed his confidence in that fact. While some lived fast and hard, usually dying young as a result, that life held no charm to Cal who wisely perceived its folly without needing to experiment in it. Yet, he was ready for death, should it come. The maxim he would repeat in maturity, “Do the day’s work,” captures both that focus on today — not entertaining long-term plans — but also the care, thought and integrity invested in the tasks at hand. Above all, we catch a view of Calvin, not as a fully-developed POTUS at age twenty-three, but as approaching the worthy man he aspired to be, a boy in search of his father’s approval, but also an intelligent, earnest, kind-hearted, and capable person. Coolidge was a complicated personality, but, as Mr. Booraem reveals, he was also a heroic one, deserving our admiration and, in not insignificant ways, our emulation. You can find Mr. Booraem’s fine book here. 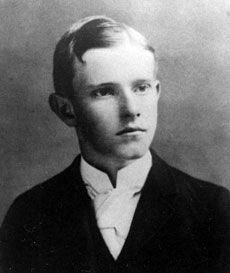 Coolidge during his time at Black River Academy, age 18.